There are many reasons to want to prepare meals in advance at this time of year. Perhaps you have house guests and you’d like to serve something delicious and hearty for breakfast, but you don’t want to be in the kitchen while everyone else is hanging out. Or maybe you want to wake up Christmas morning and enjoy a casual and relaxed atmosphere but still serve something special. Or you’re just lazy and this recipe is simple enough for your spouse to prepare. Whatever the reason you want a quick, easy, and delicious meal, I won’t judge *wink*. 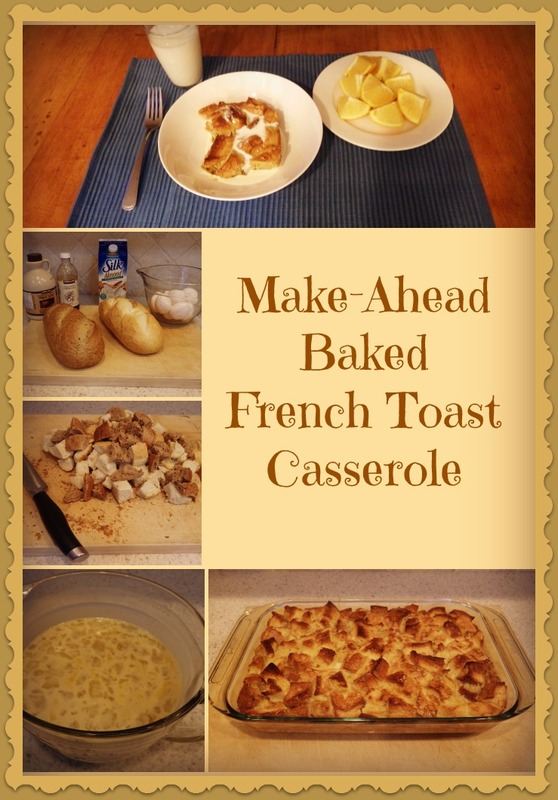 The fun with this French Toast Casserole recipe is that you can customize it to your family’s preferences. It is versatile and accommodating of likes, don’t-likes, and allergies (except egg). You can make it your own simply by adding some of your favourite mix-ins. So enough jibber-jabbering, let’s move onto covering the basics. You can make this the night before and refrigerate until you are ready to pop it in the oven. You can make it at the last minute, but I like the texture better when the bread has had at least a few hours to soak. Grease a 9”X13” baking dish, preferably glass. I’ve used butter, margarine, vegetable oil, and coconut oil. All of them worked, and each of them offered a slightly different flavour profile. I’ve also made this in one of my Denby casserole dishes to make it look a little fancier. If you choose a deeper baking dish, you may have to adjust cooking times. Cube your favourite bread. This is a good time to use up slightly stale bread. The casserole is WAY better with a bakery loaf as opposed to an off-the-shelf loaf of preservative-ladden factory-produced bread. The bakery bread soaks up the liquid like q sponge, yielding a better texture and flavour. Our favourite is a mix of French bread and multigrain. I have not tried it with gluten-free bread, but I’ve tried it with just about everything else, including leftover bits of stale bagel! Mix all of the ingredients in large bowl. There’s no fancy order to adding ingredients. Just put everything in the bowl and give it a good mix to break up the eggs and to combine all of the ingredients. 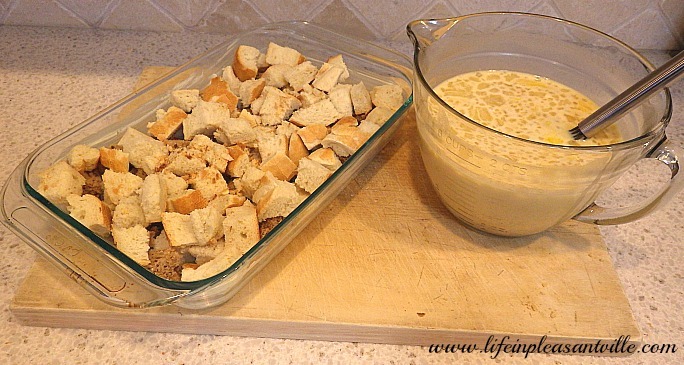 Place bread cubes in the greased baking dish and pour egg-mixture evenly over top. Use a fork or your fingers to submerge any dry pieces of bread floating on top. Cover with plastic wrap and place in fridge overnight. Remove from fridge and place in a 350 degree Fahrenheit oven for 45 minutes to 1 hour. I usually don’t bother preheating for something like a casserole that doesn’t require precision, say like a shortbread cookie. At 45-50 minutes cook-time, the casserole is a little softer in texture. At 1 hour, the custard-like mixture is more set. I find that if the casserole has not sat at least for a few hours, I have to definitely cook it for the full hour or I end up with a pile of raw egg goo *ick*. Once you remove the casserole from the oven, let it sit for 10 minutes before cutting. This allows it to set (think lasagna). You can substitute various liquids for the milk. I’ve used both almond milk and coconut milk and prefer these to the cow’s milk. They add depth to the flavour. Add some of your favourite spices like cinnamon, ginger, and cardamom. I tried making this a savoury dish once … I’d say that was my only failure. Even though I omitted the sweetener and added Sriracha and crumbled sausage, my brain was expecting something sweet. Before placing the casserole in the oven, you can add all kinds of ingredients: shredded coconut, toasted almonds, dried cranberries, blueberries, even chocolate chips if you want to serve this as a desert. Before baking, you can also add a crumble to the top. Mix a stick of butter, ½ cup flour, ½ cup brown sugar, and cinnamon and sprinkle over the top just before baking. 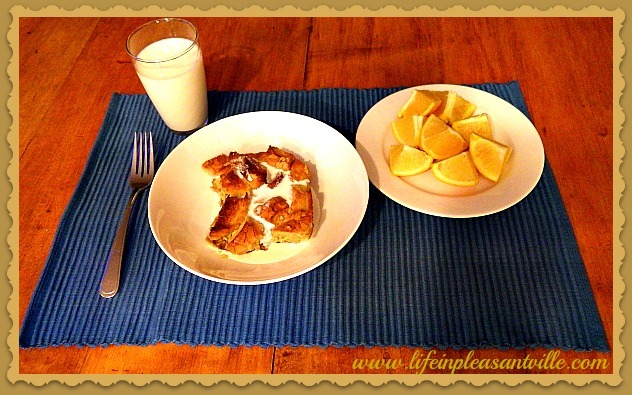 Serve just like that, with maple syrup, or even with a splash of almond milk or cream. Add a glass of milk and some fruit on the side and you’ve got a meal. P.S. No idea where the recipe came from. I’ve been making it for years and I’ve made it so many different ways. The only things you want to keep roughly the same is the ratio of wet to dry. This is a crowd-pleaser. Give it a try. It’s *virtually* impossible to screw up.